In a Mediterranean garden belongs a fig tree. He is known for his graceful leaves and delicious fruit. Fig trees are happy in a sheltered place. Fig trees love the sun. Fig trees are preferably facing south. 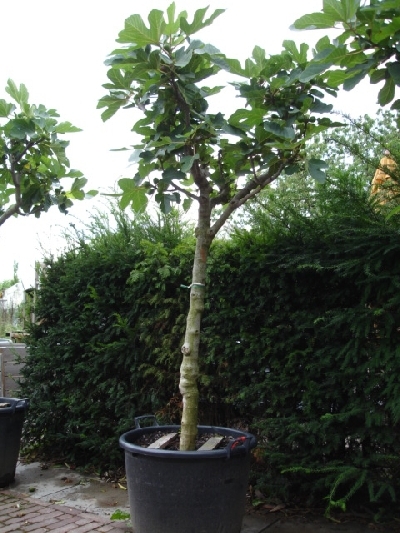 Fig trees lend themselves well to placement in the ground. Fig trees plenty of water. Fig trees can withstand frost. The Bergerie has a collection of fig trees in the age from 7 to 40 years old, as well as smaller fig bushes. The origin of the fig trees are in Western Asia. They have been cultivated for centuries. Due to the mild winters the tree can thrive here. The can grow up to 10 meters. The bark has a light gray color and is smooth. The leaves are thick, leathery and have a heart shape. The upper side of the leaf is dark green and rough. The lower-side is also hairy and has white veins. Three times a year a fig can produce fruit. Here, in Europe, this is not often the case. The fig that we know is a cultivated species. The pear blossom resembles a hard green nut. On the inside of the “nut” are the flowers. The male flowers are at the top of the “note” and the female flowers sit down. At the upper end there is an opening which is large genoegs for an insect. This bug allows for fertilization. Then, the seeds are produced. Then the pear is mature and is sweet smelling and soft. The color is also changing during this period. The inside of the fig sometimes has a green or red color. Furthermore there are a lot of seeds in the fruit. It is best when ripe the fruit is ready to eat.